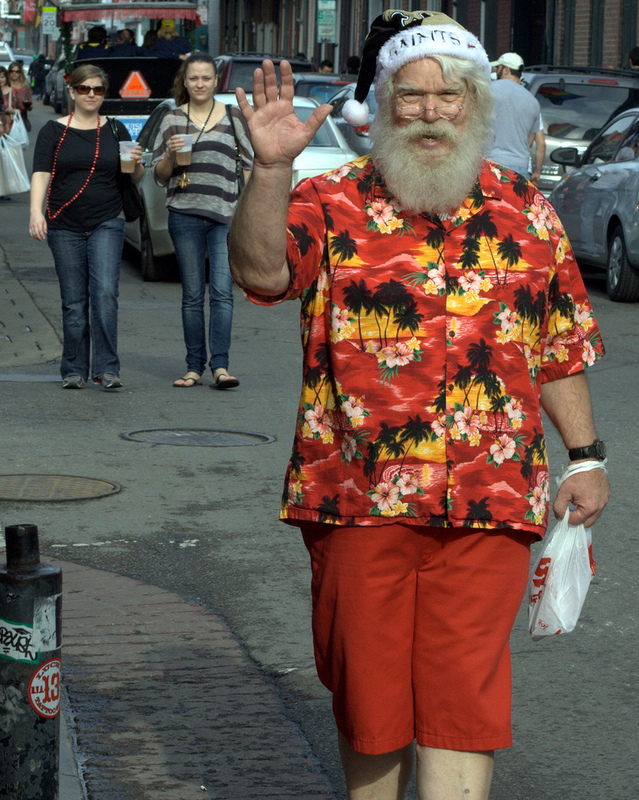 Hibiscus is just that big flower that decorates Hawaiian shirts. I mean… vegetables aren’t usually printed on shirts, right? 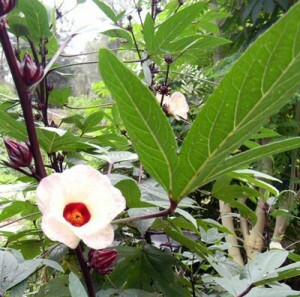 Today we’ll look at that and other amazing edible hibiscus. What you discover may shock you. I mean, some of these are seriously good edibles. Don’t believe me? Read on! Since we already mentioned this one, hey – let’s start with it. Look at that bloom. It certainly wouldn’t look out of place on a flowery shirt, would it? With okra, unlike the other hibiscus on this list, you eat the green seed pods. Pick them too late and they’re fibrous. NOTE: this advice doesn’t apply to gals shopping for a husband. It’s just for okra. Okra is an annual that thrives in the heat of summer, hence its popularity in the south. It’s also highly productive as long as you keep it picked regularly. Though I’m not a big fan of okra, I don’t mind eating the occasional raw pod or two off the plant while wandering through the garden. Bonus: okra leaves are also edible. At Thanksgiving, my wife uses it as a cranberry substitute and everyone is impressed by the near perfect impersonation it does of the renowned fruit of northern bogs. Though Jamaican sorrel is another annual (or short-lived perennial), it’s a productive and stunningly beautiful plant that’s very worth growing. In the Caribbean, the plant is grown extensively for its deliciously tart calyxes (that’s the cranberry bit). Unlike okra, the pods are discarded. As a wonderful bonus, the young leaves of Jamaican sorrel are a tender and lemony-tart addition to salads. My children regularly pick them off the plant and snack on them while wandering through the yard. Growing Florida cranberry is easy. Plant the seeds as early as you can in the year and they’ll grow into a bushy shrub that reaches about 5′ tall. Blooms don’t appear until the days shorten in the fall. Harvest after blooms appear when the calyxes (the bases of the blooms) swell to 3/4 to 1″ in diameter. You’ll have to pick regularly or they’ll get away from you. For a deeper look at this amazing edible, check out my survival plant profile. 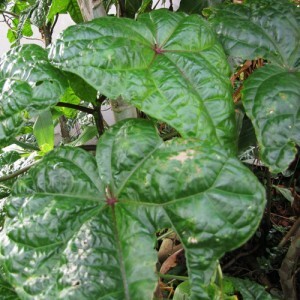 This plant has many common names and is relatively unknown as a vegetable inside the US (with the exception of Hawaii). Though it’s a tropical plant, commenters at Dave’s Garden report having it re-grow from the ground after cold winters in zones 7 and 8. The shape of the leaves is quite variable. I have two varieties in my nursery: one with very long, thin leaves; the other with broad dinner-plate sized leaves. Both types make for excellent salad greens. 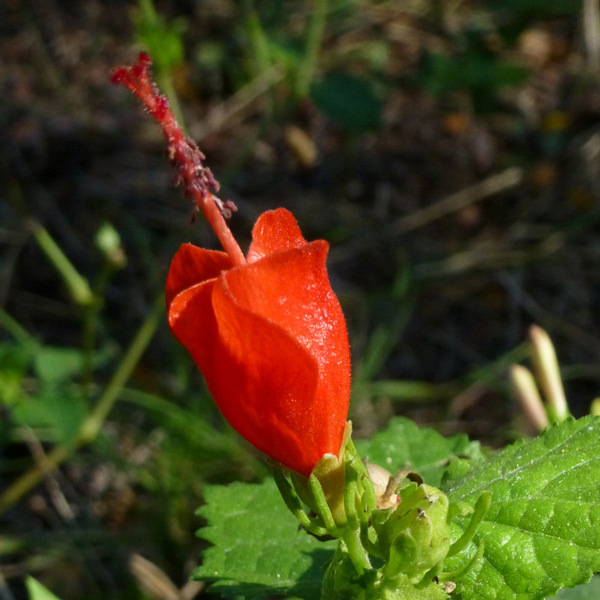 Around here, most of the Turk’s Cap shrubs seem to be a sterile Mexican form. The blooms are edible and filled with nectar, making them a delicious snack to pick on the go. The plant is also quite attractive to hummingbirds. The native Texan varieties will often set fruit which is also reported as edible (though I haven’t been lucky enough to find a fruiting one here in Florida so I can’t vouch for the flavor) and good for jams or fresh eating. The young leaves can also be eaten, though they’re rough textured on the plants I’m growing here so I generally stick to other hibiscus leaves. I wouldn’t call Turk’s Cap a major edible… but it’s a delicious snack and the blooms are striking against the dense green foliage. It’s also a low-maintenance plant-and-forget shrub. That means you get food for no work. This plant is a particular favorite of mine. Though similar to the Jamaican Sorrel mentioned above, the Cranberry hibiscus is a true perennial. Unlike Jamaican sorrel, the calyxes on this plant are tiny and not worth harvesting. 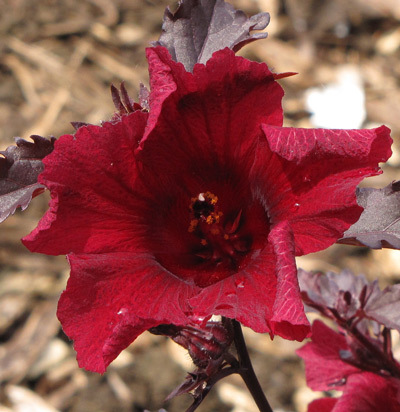 Often grown as an ornamental, Cranberry hibiscus shines in the landscape and at the table. The young leaves are lemony-tart and excellent in salads. Though you can pull this plant off into about USDA zone 8 (with damage from frosts), you could easily grow it in a large tub and drag it into an outbuilding during freezing weather further north. If you ever get a chance to taste the delicious leaves, you might decide it’s worth the work. Even if you don’t live anywhere near the tropics, chances are there’s an edible hibiscus (or mallow) somewhere near you. This page has a good list of links if you’re interested in gathering more information. Click over to ThePrepperProject.com to read more articles on gardening, homesteading and preparedness. I have several of these in my garden. I love them for their ease and for how they appreciate the long, hot, humid summers we have in my south Alabama garden. I have Turk's Cap, which I planted for hummingbirds. I didn't know it was edible. It is perennial in my yard. It even survived last year's exceptionally cold weather, when my other plants in that garden all died. That's great, Christy - they're tasty. Good to hear about the cold-hardiness, too. Your'e my kind of gardener. 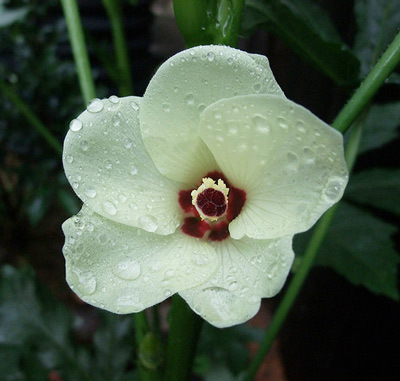 I just planted some okra to grow in my tropical Australian garden. The Florida Cranberry is called rosella here and a lot of people use it for jam. I dry them for tea. Good for you. 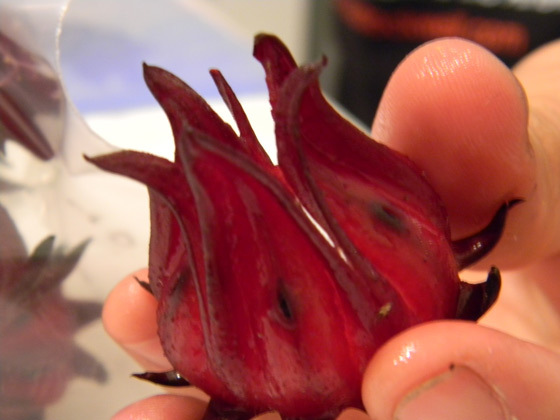 The flavor of roselle tea is spectacular - it tastes like tart sunshine. I had just learned that okra are part of the hibiscus family and now I learn you can eat the leaves!?! Yay! You learn something every day! My Roselle is about 8 feet tall and just one big giant stalk. I'm going to grow another one in the spring and nip off the top as an experiment cause the 8 foot single stalk version seems silly! But I'm glad to know they produce flowers/calyxes in October! I was giving up hope! Hehheh. I know - they're scary. Darn things hold off so long you get nervous. I wonder why yours is so tall? Sounds like it needs more sun.